Saturdays are not structured much. There was a movement to go to the dump and pick up interesting things that might spark art works – but I am forbidden to take things away from the dump because I live in a small house with other people in it. And my own stuff is insufficiently curated, so I should not be picking up what other people have determined they can live without. So instead I sat in my studio space and did…. nothing much. I really did recharge everything; phone, netbook, camera, ereader. I tried to call home, but it was hard to hear and be heard, so it didn't go on for long. 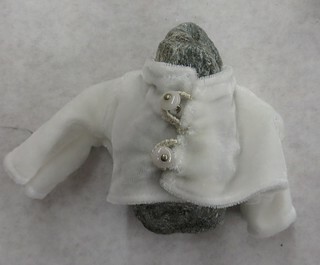 Shortly before I left for Haystack I had a dream that I made white velvet jackets for beach stones, but then I had to put them back on the beach before I left. So I collected a handful of interesting beach stones (there aren't so many lovely smooth ones, which are the ones I was thinking of, so I've settled for ones wiht character and large crystals). That is the story behind the existing white velvet jackets on rocks. There has been some consternation that there are no sleeves on these jackets. I have pointed out that rocks do not, in fact, have arms, thus negating any reason for sleeves, but the sentiment persists that I should have sleeves. So last night I built a rock jacket with sleeves. Ifind this very disturbing, and I am not at all sure about it, but it has provoked a good deal of amusement. 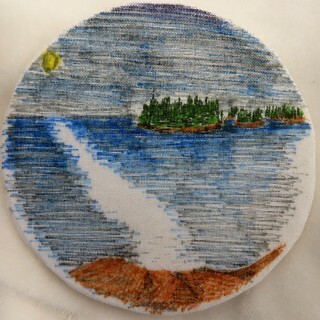 Today is hot, so I am thinking I might make a linen jacket for the next rock. Sleeveless. Perhaps this is a pet rock? Thanks dear Lee, had a good laugh when I saw the second photo !!!!!! “Warming the stone child” with those little velvet jackets? This is very strange, by also strangely interesting. And I would agree with you–unless a rock has arms, it doesn’t really need sleeves on it’s jackets.